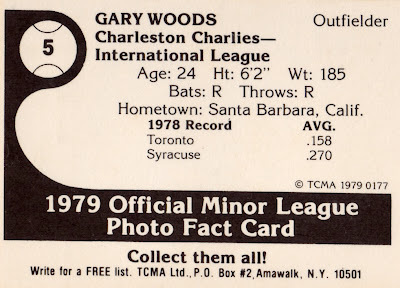 Fans who track Toronto's expansion year of 1977 should remember Gary Woods, as he started their inaugural game in CF, an early April contest that featured snow on the field and sober fans in the stands. (Exhibition Stadium didn't sell alcohol, a rarity in non-Prohibition baseball.) 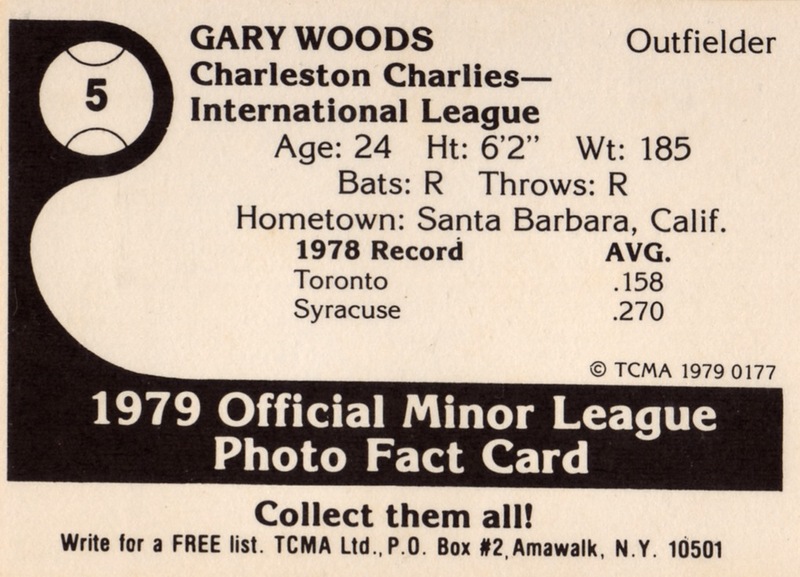 Woods bunted for a single, stole second, and came around to score the franchise's second run in an eventual 9-5 win. I'm a fan of colorful uniforms like those sported by Charleston's Charlies, which served at the time as Houston's International League affiliate. 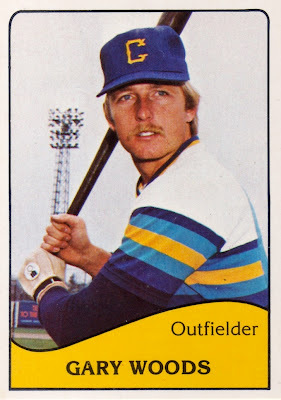 Those bright stripes probably carried over from their parent club, itself one of the most distinctive looks in baseball history. Unfortunately, imitation isn't always for the best. This "uniform effect" carried over to another Houston farm team, the Tucson Toros, in a particularly garish way just a year later. "There are a whole lot of guys with more talent than I ever had who never got the opportunity. I went to the big leagues, went down, made it back and stayed...I can look in the mirror and say I did all I could to be the best possible player I could be." Woods now lives in California and coaches for the Santa Barbara Foresters, who play in a July-August summer league for college players. Value: Bought this for $2 on MinorLeagueSingles.com.